Persistence Market Research analyzes the global flash-based array market in a new publication titled “Flash-Based Array Market: Global Industry Analysis and Forecast, 2016–2024”. This study provides data for 2015 along with a forecast for the period 2016 – 2024. The main objective of the report is to identify dynamics in the market and provide recent updates and insights affecting various segments of the global flash-based array market. To provide better understanding of the market, the report also includes an analysis of drivers, restraints, and trends in all five regions namely, Asia Pacific, North America, Europe, Latin America and the Middle East & Africa, which influence the current market scenario and future status of the global flash-based array market during the period of forecast. This research report provides detailed analysis of the global flash-based array market and offers insights on the various factors driving popularity of these products and solutions. The market study provides comprehensive assessment of stakeholder strategies and imperatives for succeeding in the business. The report segregates the market based on flash-based array products across different regions globally. The report starts with an overview of the global flash-based array market. In addition, this section includes an analysis of the value chain, key drivers, and challenges influencing the flash-based array market globally. A detailed analysis has been provided for every segment in terms of market size analysis for the global flash-based array market across different regions. The report provides a detailed analysis covering absolute dollar opportunity, BPS analysis, and market attractiveness analysis across different regional markets. Key regions and countries assessed in this report include North America (U.S., Canada), Latin America (Brazil, Mexico, Argentina and rest of Latin America), Europe (Germany, France, U.K., Russia, Spain, Italy, and Rest of Europe), APAC (Japan, China, India, Australia & New Zealand, and Rest of APAC), MEA (GCC Countries, South Africa and rest of MEA). The final section of the report focuses on the competitive landscape to provide clients with a dashboard view. This section is primarily designed to provide clients with an objective and detailed comparative assessment of key players in the global flash-based array market. Report audiences can gain segment-specific vendor insights to identify and evaluate key competitors based on an in-depth assessment of capabilities and success in the marketplace. Detailed profiles of providers are also included in the scope of the report to evaluate their long-term and short-term strategies, key offerings and recent developments in the global flash-based array market. The global flash-based array market is consolidated in nature, means this market is governed by top players, hence, by considering the market share contribution of top players Persistence Market Research has calculated the global numbers for this market. The forecast presented here assesses the total revenue by value across the market. In order to offer an accurate forecast, the report starts by sizing the current market, which forms the basis of how the flash-based array market will develop in the future. In addition, it is imperative to note that in an ever-fluctuating global economy, the report not only conduct forecasts in terms of CAGR, but also analyzes the market on the basis of key parameters such as year-on-year (Y-o-Y) growth to understand the predictability of the market and to identify the right opportunities across the global flash-based array market. As previously highlighted, the global flash-based array market is split into a number of segments. All segments in terms of product type, enterprise type, storage capacity, end-user vertical and based on different regions are analyzed in terms of basis point share to understand individual segments’ relative contribution to market growth. Also, another key feature of this report is the analysis of all key segments in terms of absolute dollar opportunity. This is traditionally overlooked while forecasting the market. However, absolute dollar opportunity is critical in assessing the level of opportunity that a provider can look to achieve, as well as to identify potential resources from a sales and delivery perspective in the global flash-based array market. The global flash-based array market was valued at nearly US$ 15 Bn in 2015 and is expected to reach nearly US$ 63 Bn by 2024 end. In terms of value, the global flash-based array market is expected to register a CAGR of 18% over the forecast period. In terms of revenue, the U.S. is projected to be the most attractive market in the North America flash-based array market during the forecast period. The market in Canada is expected to register high Y-o-Y growth rates throughout the forecast period and is expected to exhibit a CAGR of 17.3% between 2016 and 2024. In terms of revenue share, the market in U.S. accounted for a relatively high share, and was valued at nearly US$ 5,000 Mn in 2015. The U.S. market is expected to remain dominant during the forecast period. 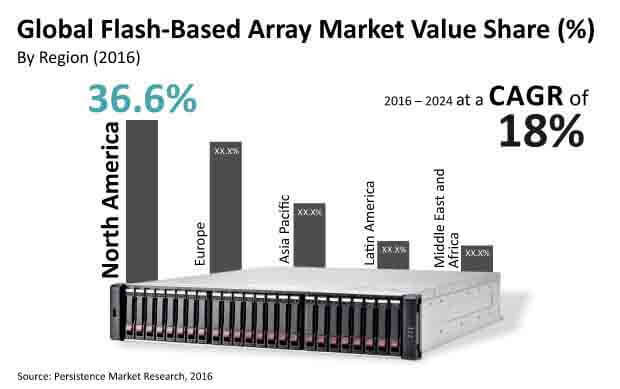 In terms of revenue, the hybrid flash array segment is projected to be the most attractive segment in the North America flash-based array market during the forecast period. All-flash array segment is expected to register high Y-o-Y growth rates throughout the forecast period and revenue is expected to register a CAGR of 24.1% between 2016 and 2024. Hybrid flash array segment accounted for a relatively high revenue share, and was valued at nearly US$ 5,000 Mn in 2015. This segment is expected to remain dominant during the forecast period. In terms of revenue, large enterprises segment is projected to be the most attractive segment in the North America flash-based array market during the forecast period. SMEs segment is expected to register high Y-o-Y growth rates throughout the forecast period and revenue is expected to register a CAGR of 18.1% between 2016 and 2024. Large enterprises segment accounted for a relatively high revenue share, and was valued at nearly US$ 4,000 Mn in 2015. Large enterprises segment is expected to remain dominant during the forecast period. In terms of revenue, more than 1PB segment is projected to be the most attractive segment in the North America flash-based array market during the forecast period. Between 100 TB to 500 TB segment is also expected to register high Y-o-Y growth rates throughout the forecast period and is expected to register a CAGR of 17.1% over the forecast period. In terms of revenue, BFSI segment is projected to be the most attractive segment in the North America flash-based array market during the forecast period. Media and entertainment segment is expected to register high Y-o-Y growth rates throughout the forecast period and is expected to register a CAGR of 20% between 2016 and 2024. BFSI segment accounted for a relatively high revenue share, and was valued at nearly US$ 1,500 Mn in 2015. BFSI segment is expected to remain dominant during the forecast period. Growing adoption of cloud computing, mobile devices, Internet of Things, cognitive systems, artificial intelligence, and machine learning is driving the need for real-time data processing in order to enable delivery of efficient services, anytime, anywhere in the shortest time possible. This real-time data processing feature is fueling demand for high performance data storage systems that are in line with the requirement of the above-mentioned technologies. Proliferation of big data and unstructured data requires innovative storage systems to store data for long periods of time as well as offer easy accessibility. Big data and unstructured data volumes are expected to register a high CAGR over the next five years. Currently, most all-flash arrays have addressed structured data at high performance transactional processing requirements. In addition, the need for efficient storage systems for unstructured data and big data is creating potential market opportunities and resulting in leading flash array vendors developing and offering innovative solutions in the market. In March 2016 for instance, Pure Storage launched Flash Blade Array to target unstructured and big data, file-access workloads, while other vendors are yet to offer such solutions. Initially, in flash array market start-ups were playing a prominent role because these enterprises introduced a new revolution in the storage market through flash-based SSD – a non-movable drive that stores data on solid-state flash memory. Start-ups have implemented new innovation in terms of technical development and this new revolution has encouraged six big storage system vendors to include flash options in their storage product portfolio to sustain their position in the market.